Sunday turned out to be a gorgeous sunny day….a big turn around from a few days ago of frigid temperatures. I’ve been reading quite a few blogs lately about vintage shopping. I was especially intrigued by vintage/estate jewelry. I dragged hubby to a nearby town where I hoped to find my first vintage piece….sad to say, no luck this time. 😦 I did manage to find a vintage inspired, handmade necklace by a local artist that made my eyes twinkle and hubby’s wallet a little lighter. It wasn’t the vintage piece I was looking for, but I’m pretty happy to have found it! 🙂 I’ll share it with you on another post. 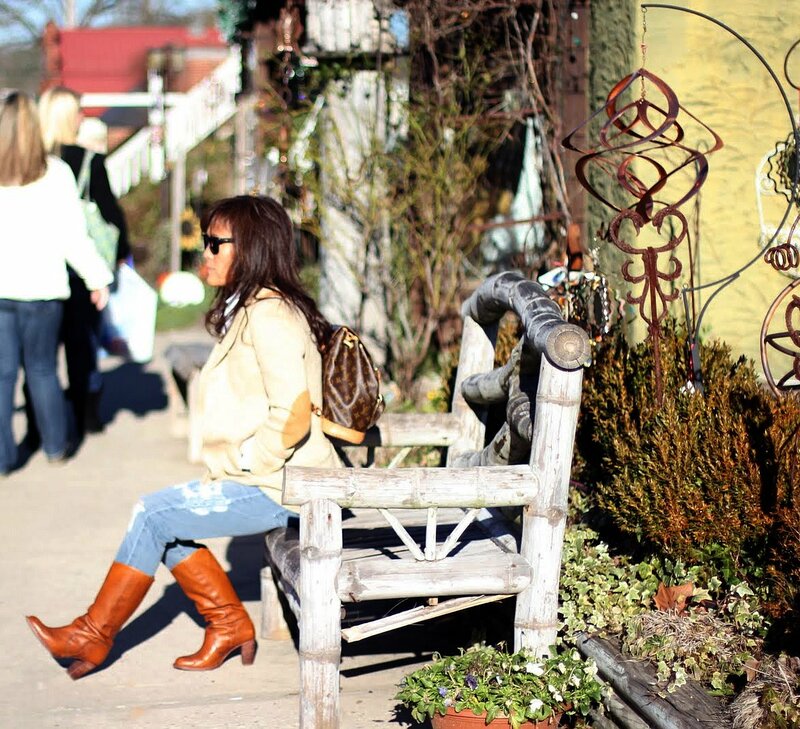 And here are some pics from the hunting ground ~ a quaint little town with lots of unique shops and great restaurants! I want to thank dear hubby for indulging me in my new-found hobby (blogging)… for taking endless photos…for taking an interest. Thanks hon’! P.S. 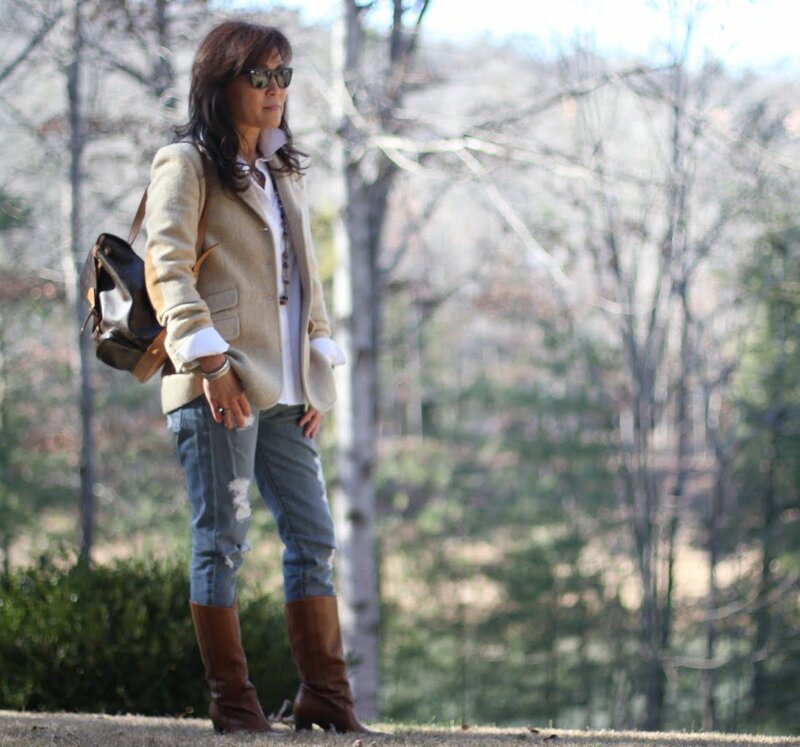 I’m not fretting over these tattered jeans ~ age appropriate or not ~ I’m going for it! Lol! This is SO my daughter in the mornings! Thank you so much for visiting and have a wonderful week! Don’t forget to check out the fabulous ladies at Visible Monday and Monday Mingle and Trending Thru The Decades: Neutral. GREAT outfit for hunting for treasures! I’m sure you’ll find that perfect vintage piece you’re hunting for – it’s out there! And, I really feel like the *best* jewelry is just starting to make it’s way back into the public – women from the 1920s-1940s had WONDERFUL taste in jewelry – real and costume! Happy Hunting! Ooh I hope so! I just need to find them! Hi C! Thank you so much! I like them, too…just have to be careful not to over do it because of my age. I think you look amazing, and this is my favorite combo. 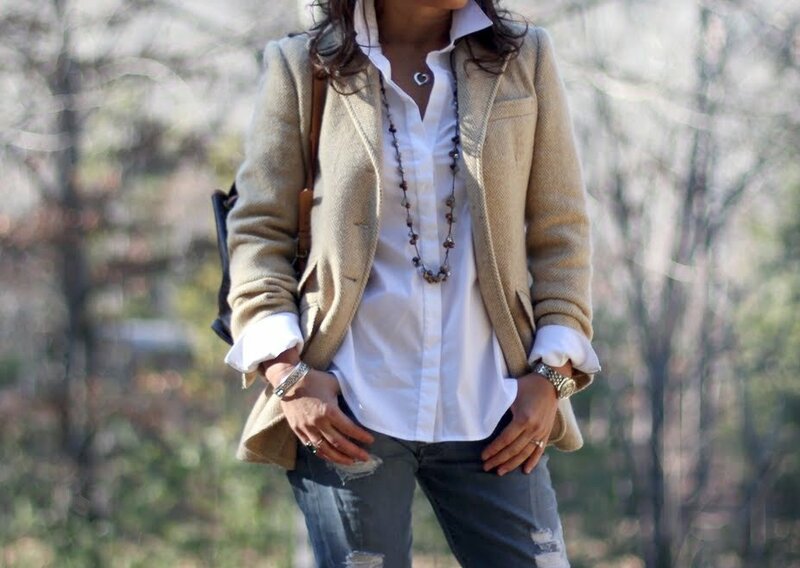 Jeans, boots, white button down and blazer. I say go for the distressed jeans. You rock them! What a fab “hunting” outfit! Nothing beats a white shirt and jeans (with all the accessories to glam it up)! Don’t worry about not finding something this time, I’m sure you will find something next time! And LOL at that cute pup pic! 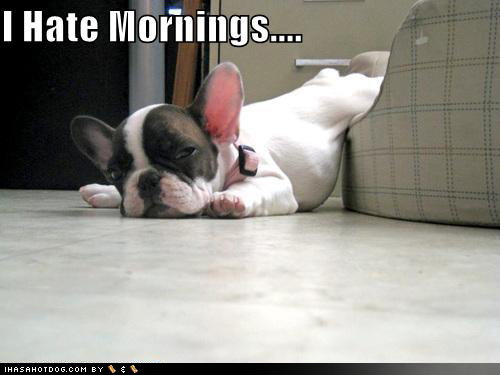 That’s me in the mornings before coffee! Thanks Sam! I’m quite excited about finding something vintage & unique! Fabulous ensemble! 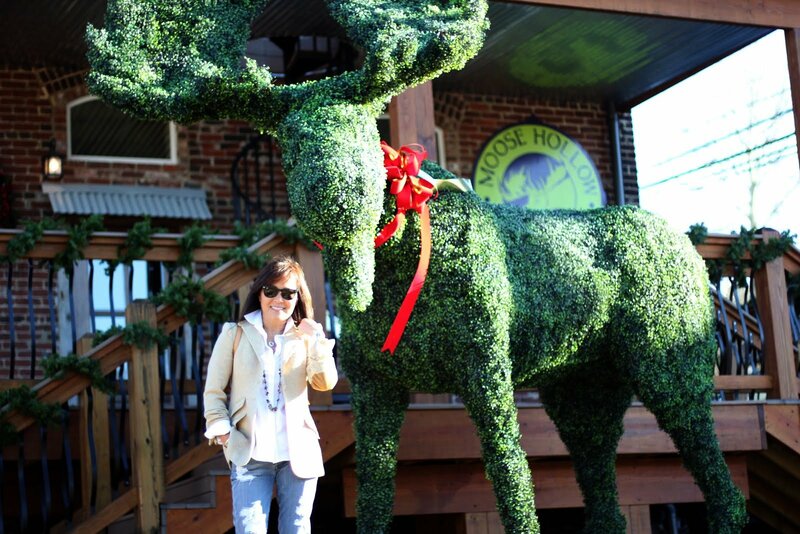 I especially love all of your locations – especially the giant evergreen moose! This means so much to me! Thank you!! Hi Stacey! Thanks for the thumbs up for the jeans…one of those should I, shouldn’t I…I’m getting adventurous alright…lol! I love this look. I have the elements but can’t seem to pull it off or find the perfect white shirt. I’m, thinking might not be right for me. As far as vintage jewelry. I’m not even close to expert. Hell I don’t know a dang thing other than I have been blessed with some very nice costume pieces. Maybe, just maybe you have inspired me to pull them out of their hat box and wear them! Hi Tammy, Me, too! I’m having a blast and meeting some really terrific people along the way! You can definitely pull this off…I think you and I have a very similar taste in clothes. 🙂 Vintage shopping is new to me…I’m kinda excited to see what I can find. I just remembered to link back to your blog..sorry. Thanks for letting me share in Trending Through the Decades. The jeans are looking just right with the whole outfit. Looking forward to more on your vintage hunts. I love vintage jewelry too and the idea that they are limited treasures. I need to get informed on how to tell if an item is a true vintage gem or not. Need to do a little research…it’ll be fun! You go girl with your teenage self!!!!! Love the torn jeans and whole ensemble!!!!! You are FABULOUS! Love this look! Those boots are pretty fabulous! this is such a great look!! love the elbow patches on your blazer! Hi Brett! Thank you, and I hope you’re doing well. I love Ralph Lauren jackets! Thanks V! Hubby’s doing a super job of taking photos! You sound like my daughter…she’s definitely not a morning person. You portray such classic beauty. Love it. You are totally pulling off the ripped jeans by keeping everything very clean cut. The photo shoot spots are amazing. The train tracks were my favorite. Photos courtesy of hubby…a budding photographer! 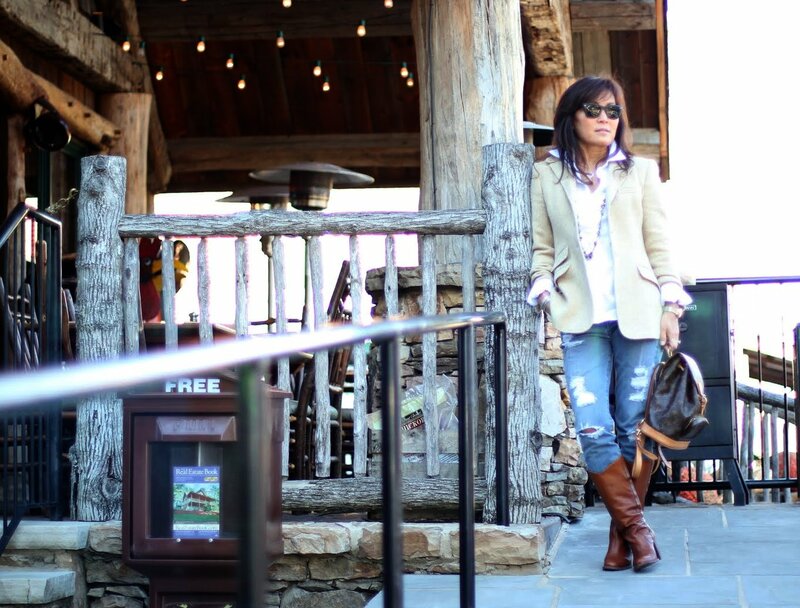 You are rockin’ the jeans, the boots, the entire look! And the photos, tell him, are dandy! Thanks Terri! He’s going to get a big head after I tell him about all the complements. You look beautiful as always….and yes I agree super photos! Love the outfit and the town photos! Hi Nav! Thanks for the comment and the visit! That is an absolutely beautiful jacket. Can’t wait to see your necklace! Looks like a charming town! Love the jacket! Charming is a perfect word to describe it! Hubby thanks you! He’s really getting better…so proud of him! Have a great week Jasmine! Thank you so much! He’s doing great! I’m very thankful that he’s so supportive! Thanks Kim! I hope I’ll come across some great vintage jewelry. My hubby thanks you! Tell hubby that he is doing an amazing job…I love these photos!! And I really like the RL jacket!! You looked perfect for shopping! Can’t wait to see what you bought! Hi Pam, I did tell hubby and he’s grinning! Most of my jackets are by Ralph Lauren…just love his collection. Well you don’t look like your in your 50s and you pulled those jeans off like you’re just in your 30s! Very well put together! I love your shopping look – so chic! Sounds like you have a peach of a husband : > Thanks so much for participating in Visible Monday. I love this look! Reminds me so much of Ralph Lauren. Most of my favorite jewelry is vintage and I think it’s well worth the hunt. Thanks Alex! Ralph Lauren is one of my favorite designers. 🙂 I’ll be hunting some more, that’s for sure! Love this look on you – casual chic. Your husband is a great photographer! My husband puts up with tasks related to blogging, too. And rarely complains. We are lucky to have such great guys. Thanks A! Yes, we are very fortunate to have our hubby’s support! Happy week to you! Your style is always classy! Love it! Thanks Daisha! Good luck with your move! This is a perfect weekend outfit- chic yet casual, and easy to explore in. Can’t wait to see your jewelry score! Thanks Bella Q! It was a good first hunt. I just need to get more knowledgeable about vintage jewelry.